The back and body of the Gizzard shad are often dark and black. 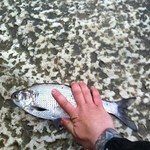 Gizzard shad are characterized by their inferior, sub-terminal, toothless mouth and thick-walled, gizzard-like stomach. The body is short and compressed from side to side in adults. Scales small, thin, and somewhat irregular, without rough spines and absent on the head and back between the operculum and the dorsal fin. A dark spot behind gill opening. The last dorsal ray is formed into a long filament. As with other species of the genus Dorosoma, such as threadfin shad, the filament length varies greatly with age. The filament is absent in young fish, but begins to grow after two inches and continues to grow until the fish becomes fully mature at eight inches. Although similar in appearance to other clupeids (members of the river herring family, Clupeidae), Gizzard shad are a Maryland resident species rather than a migratory anadromous species such as the American shad or hickory shad. They spend their entire adult life in fresh and slightly brackish waters of the Atlantic and Gulf coastal plains streams and fresh water lakes and reservoirs from New York to Mexico. Occur mainly in freshwater in large rivers, reservoirs, lakes, swamps, temporary floodwater pools, etc., but adults also found in brackish or saline water of estuaries or bays, preferring quieter open waters. Juveniles are found in great abundance well upstream from brackish water. Gizzard shad are widely distributed throughout the upper tidewater areas of the Chesapeake Bay, but are less common in higher salinity areas (>30 ppt). In the coastal waters of its range, adults have been found in the euryhaline salinity zone where salinities can reach 33.5 ppt; however, the occurrence of larvae and young is predominantly in fresh or oligohaline waters (0-5 ppt). They are found in about 70% of the freshwater lakes and large ponds on the Eastern Shore. Gizzard shad spawning generally commences in March in tidal freshwater areas of the lower Chesapeake Bay and by late April in the upper tidal areas. Peak spawning occurs in May. A diversity of habitats that include large rivers, small streams, ponds, and large lakes are utilized as spawning habitat. Both females and males usually reach maturity by age 2 – 3, with females producing 50,000 – 379,000 eggs. Mature gizzard shad broadcast their eggs and sperm simultaneously near the surface. The eggs sink to the bottom where they adhere to submerged objects. After spawning and throughout the summer months, adults and young can be found both in tidal fresh and slightly brackish waters close to the bottom in shallow water. By fall gizzard shad migrate downstream to deeper estuarine waters to over-winter. Reservoir populations spawn in creeks tributary to the reservoir. Maryland has no regulations regarding gizzard shad. Gizzard shad is not valued for human consumption because of its soft, rather tasteless flesh, and numerous fine bones and strong odor. Gizzard shad do not bite baited hooks readily and if caught are almost always discarded. They are more often foul hooked as anglers cast shad darts for river herring or American and hickory shad into streams in which these desirable species are mixed with spawning migrant gizzard shad. Novice anglers often confuse some of the large (11-14 inch) gizzard shad that they have foul hooked with American or hickory shad. The deep body, small mouth and the thread on the last ray of the dorsal fin separate the gizzard shad from other related species. A majority of the lakes and ponds in the Chesapeake Bay drainage system have large populations of gizzard shad, including Rocky Gorge and Triadelphia Reservoirs and Wye Mills, Unicorn, Johnson and Leonards Ponds. Pollution-tolerant species such as gizzard shad have been increasing in numbers in the Chesapeake Bay region since the late 1980's and may be indicative of reduced habitat quality in the Bay. Species tolerant of reduced water quality particularly benefit from nutrient enrichment. ​For more information on gizzard shad and their management, please contact Jim Thompson.